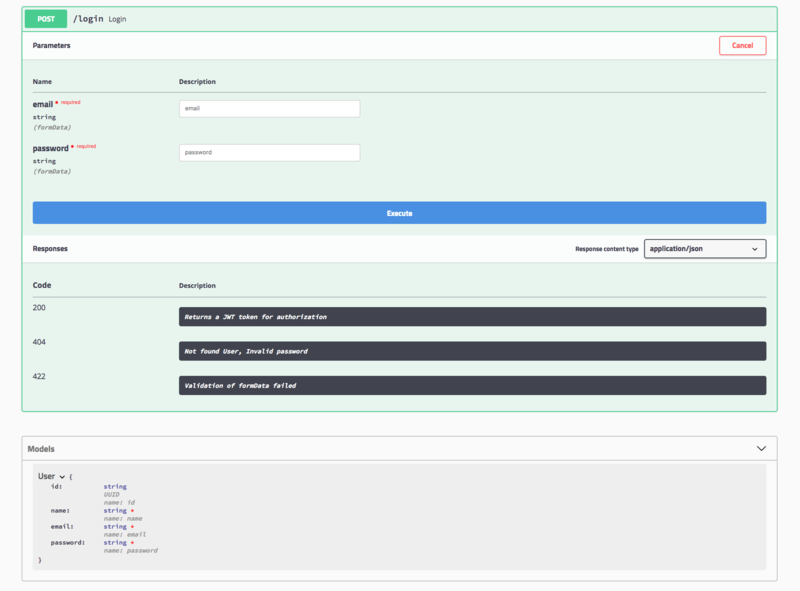 A Swagger plugin to generate API documentation for Phalcon PHP framework. This bundle/plugin parses your source code and generates swagger documentation for your API. The bundle has one controller with 2 actions. Swagger-UI uses CDN's for its assets, therefor no js or css files are included! You can install the bundle via composer or just download the git repos and paste it into your project dir. The first route is the route of the json response, which swagger needs in order to render the documentation. This URL maps to a controller which scans your project for annotations. The second route is the route where you want to be able to access the documentation. I am using an env file for my configurations, therefore the first route is a parameter in my env file. The reason for this is that the URL for the json response needs to be registered in the DI as well. The bundle is expecting an entry with the name swagger in your di container. Now, it is up to you how you get the swagger entry into your di container. You can just go and register all the values statically. The usage is the same as with the standard Swagger library, see https://github.com/zircote/swagger-php for more info. *             url="URL to the license"
!Please note that the configuration is overwriting the annotation, therefore use this as an extend only! *     description="Returns a JWT token for authorization"
*     description="Not found User, Invalid password"
*     description="Validation of formData failed"
I came up with the library quiet fast and had no time to write tests or test it on more examples. The library should work and I am using it in my projects. Everyone is free to use or modify it as he sees fit. I will be more than happy to have some pull requests :) if someone is interested.